La Pila is a 17th Century warehouse once used for storing rice. In fact it’s name originally comes from the term “pilatura”, which is the process of converting unrefined rice into white rice. 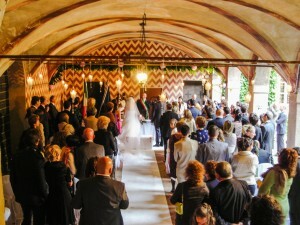 This unique and unusual venue is located between Lombardic abbeys, castles, and the natural oasis between the rivers Po and Sesia. Despite the centuries, it still retains its rural features such as the Lombard terracotta tile floor and the wood trusses supporting the ceiling, along with some machinery dating back to the early 1900’s. Nowadays La Pila has many aspects which highlight its beauty: a simple rusticity from its agrarian past, the liveliness of the permanent exhibitions dedicated to the designer Ken Scott, and the romantic atmosphere overlooking the castle. 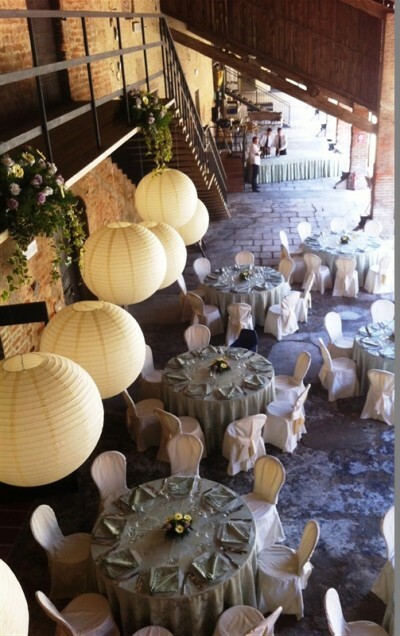 Being a municipal building, it is possible to celebrate the official civil ceremony both in the halls and the courtyard of La Pila. Otherwise for the religious ritual there is the nearby Parish of Santirana. 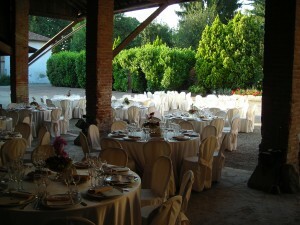 The building offers different halls which can accommodate up to 250 people, as well as a beautiful courtyard and a colonnade where the aperitif can be served and the cake cut. The location can also organise banqueting, floral decoration, musical entertainment and access to the park of the castle by separate arrangement. More pictures of the venue can be seen here.